Here is an explanation of the Corporate Debt Rating Systems. Moody's and S&P are the largest debt rating services. The news often mentions when a large company's debt is upgraded or downgraded by a debt rating service. These stories often make news because the company's financial health is being examined. Downgrades typically mean that, based on history, firms in similar financial condition have been more likely to default on their debt. Upgrades of course mean the opposite. Many people are unaware of what the actual debt ratings mean. The Moody's rating is based on statistical calculations of a company's likelihood of default. Most explanations give verbal descriptions for the ratings, such as Aaa = "Highest Rating Available" or Ba = "Low Grade", the first level of "Below Investment Grade" or the first level of "Junk Bonds". These descriptions seem useless without a way to determine what "Highest Rating Available" and "Below Investment Grade" mean in terms of the likelihood of default on the terms of repayment. What is important is the chance that the company is not going to live up to its obligations, and that means the percentage of companies that default with a given rating. Moody's calculates this information, but it can be hard to find. So, here you go. The chart below shows the Moody's Debt Rating system along with the data that Moody's has calculated for the default rate of bonds that defaulted within one year of having a given rating for all companies between 1970-2001. You can see that Aaa means that no company has defaulted within one year of having an Aaa rating. You can also see that only 1.21% of companies with a Ba (Below Investment Grade or Junk Rating) have defaulted within a year of having that rating. This first level of non-investment grade doesn't quite seem like Junk, at least in the short term. Below investment grade. "Junk Bonds"
The ratings from Aa to Ca by Moody's may be modified by the addition of a 1, 2 or 3 to show relative standing within the category where the highest within the rating is 1 and the lowest is 3. Ratings also need to be monitored as they change over time. Just because a company may have a low chance of default within one year of a given rating doesn't mean that their rating can't change, and rating changes have other market effects due to the increased or decreased likelihood of default. The graph below shows the cumulative default rate of companies based on their initial Moody's rating at the time the bonds were issued. The chart above only shows the Moody rating, and the number of defaults that occurred within one year of that Moody rating. Below, you can see that the Aaa Bonds have very low default rates, even over extended time periods. You can also see that Ba bonds have a steadily increasing default rate as the years pass. 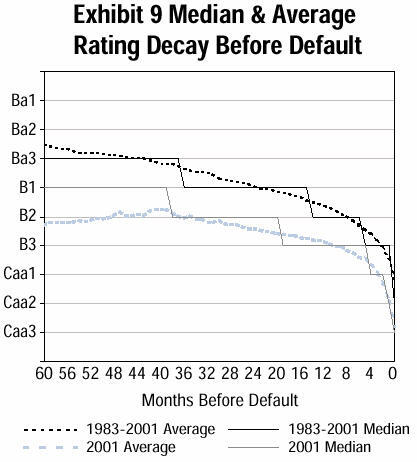 Caa-C bonds also have a very large chance of default over virtually all time periods. It is obvious that if a Aaa bond never defaults within one year, as the chart above shows, but that over time bonds that were initially Aaa show some defaults at the 15 and 20 year mark, that they had to have been downgraded at some point along the way. So, on average how far in advance do downgrades come before a company defaults. Obviously for Aaa companies the answer is, at least one year in advance, since none of them have defaulted within one year. To help answer this, Moody's has looked at its ratings for a number of months before defaults occurred and determined the average rating for every time period before a default. On average, Moody's has rated at Ba3 up to 60 months before a default. From there, on average, there are steady downgrades that typically accelerate in pace as the default approaches. So, in general there is plenty of warning before a bond defaults. Usually it hits Junk status between 3 and 5 years before the default, but not always, since these are only averages. Below is a chart that Moody's calculated showing this. There are other reasons to watch the ratings. Markets react to the increased or decreased likelihood of default when a rating changes. In general, the lower the credit rating, the higher the interest rate that a given security will have to pay to entice someone to buy it. It seems that an increased interest rate will mean that an investor will be paid higher interest payments. That is not the case for fixed rate debt. In this case, the interest coupon payments stay the same, and the amount someone will pay you for your bond is decreased. That is the capital risk involved with credit rating changes. So, if you plan to hold to maturity there should be no effect, unless the bond defaults. Of course, if a bond is upgraded, again the interest coupon payments stay the same, but the amount someone will pay you for your bond will likely increase. Of course there are a whole host of factors that can lead to gain or loss of capital in bonds, the most notable is probably interest rate changes, but that's a different topic. You can see the effect that credit ratings have on the interest required for a bond here. The chart shows the latest Yield Spread for Corporate Bonds over the Treasury Bond yield for different Credit Ratings. You will see a dramatic increase in the interest rate required as the rating decreases. The table is in terms of Basis Points. One basis point is 1/100th of a percent. So 100 Basis Points is equal to 1%. The Spreads quoted are in addition to the going rate for Treasuries, which you can find here. * The ratings from Aa to Ca by Moody's may be modified by the addition of a 1, 2 or 3 to show relative standing within the category. **The ratings from AA to CC by Standard & Poor's, Fitch IBCA and Duff & Phelps may be modified by the addition of a plus or minus sign to show relative standing within the category. Here are Links to more in depth Information on this subject from Moody's.